Ideal for early summer and summer conditions - great for photography with beautiful light and generally very calm conditions. 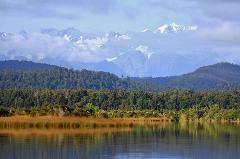 Can be the best time to see birds feeding on the lagoon. From wading birds to rainforest orchids, tidal lagoon wetlands and ancient plants and trees and river waterways - the 2 hour EcoTour is our most comprehensive tour set within this magnificent, untouched World Heritage Area. 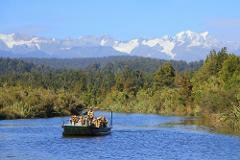 This tour is perfect for an introduction to the Okarito Wetland environment. The afternoon time slot enables you to add this to your day after a visit to the Glaciers and learn about this diverse environment from sea to mountains.